This work aimed to investigate the possible protective effects of active vitamin D3 (calcitriol) on the kidney of streptozotocin-induced type 2 diabetes rats. Diabetic nephropathy (DN) is a leading cause of irreversible renal damage. Calcitriol has anti-inflammatory and antiproliferative effects. Kidneys have vitamin D receptors, so calcitriol may modulate DN. A total of 40 male Wistar albino rats were fed on high fat and sugar diet for 6 weeks. Eight rats were used as a control group (G). Group 1 received single dose of citrate buffer and oral coconut oil. Induction of diabetes mellitus was done in the rest (32 rats) by intraperitonial injection of single dose of streptozotocin (30 mg/kg/body weight). The diabetic rats were classified into four equal groups (eight/each). Group 2 had diabetic untreated rats that received coconut oil orally. Group 3 had diabetic rats that received subcutaneous injection of isophane insulin (10 IU/kg/day). Group 4 had diabetic rats that received calcitriol (0.03 μg/kg/day/oral). Group 5 had diabetic rats that received both insulin and calcitriol in similar dose and regiment as in groups 3 and 4 for 4 weeks. The following examinations were done: (a) body weight, kidney weight, and systolic blood pressure; (b) biochemical measurements including serum urea, creatinine, creatinine clearance, microalbuminuria, blood glucose, insulin, advanced glycation end products, and transforming growth factor-β1; and (c) histopathological and immunohistochemical of kidney tissues for caspase-3 expression. The results showed significant increase of glucose, insulin, advanced glycation end products, urea, creatinine, creatinine clearance, microalbuminuria, transforming growth factor-β1, and systolic blood pressure of G2. Histopathological results revealed marked changes and increased expression of caspase-3 of G2 compared with G1. In contrast, biochemical, histological, and immuonohistochemical features in groups 3, 4, and 5 showed significant improvement compared with G2. It is concluded that calcitriol has protective effects against DN in rats. Diabetes mellitus (DM) is a pandemic disorder . Diabetic microangiopathy complications include nephropathy, neuropathy, and retinopathy that affect the quality of life . Diabetic nephropathy (DN) is the most common cause of irreversible renal damage . The pathogenesis of DN includes immunologic and inflammatory mechanisms that play a significant role in its development and progression . These factors cause accumulation of extracellular matrix (ECM) and hyperplasia of mesangial cells leading to abnormalities in the glomerular permeability and capillary pressure followed by development of glomerulosclerosis and tubulointerstitial fibrosis end by irreversible renal damage . The mechanisms of DN originate from hyperglycemia that cause activation of intrarenal renin–angiotensin system (RAS) , advanced glycation end products (AGEs) , activation of protein kinase C and cytokines such as transforming growth factor-β (TGF-β), and reactive oxidative stress (ROS) pathway . Calcitriol is a fat-soluble vitamin and has a role in calcium and bone homeostasis. Many other roles discovered for it are through binding to its specific receptors, vitamin D receptors (VDRs), which are founded in many nonskeletal tissues, such as pancreas . It has anti-inflammatory and antihypertrophic properties . The present work aimed to investigate the possible protective effects of active vitamin D3 (calcitriol) against DN of streptozotocin (STZ)-induced type 2 diabetes mellitus (T2DM) rats. A total of 40 male Wistar albino rats, weighing 200–280 g/each, were included for the examination after feeding the rats with high fat and sugar diet (feed formula: 67% normal diet, 20% sucrose, 10% tried lard, 2% cholesterol, and 1% bile salts) for 6 weeks. Eight rats were used as control group (G1). They received citrate buffer single-dose intraperitonially and coconut oil orally for 4 weeks, and the other 32 rats were subjected to induction of DM by intraperitonial injection of single dose of STZ (30 mg/kg/body weight) freshly dissolved in citrate buffer at pH 4.5 . Diabetes was identified by measuring fasting blood glucose by glucose oxidase method at the seventh day of injection of STZ. The rats with fasting blood glucose of at least 126 mg/dl and/or 2 h blood glucose (2 h blood glucose) of at least 200 mg/dl were considered diabetic and used in the experiment. Nondiabetic rats were discarded. The diabetic rats were classified into four equal groups (eight rats/group). All protocols and methods were approved by Menoufia Medical School designated Institutional Review Board and Ethical Committee. 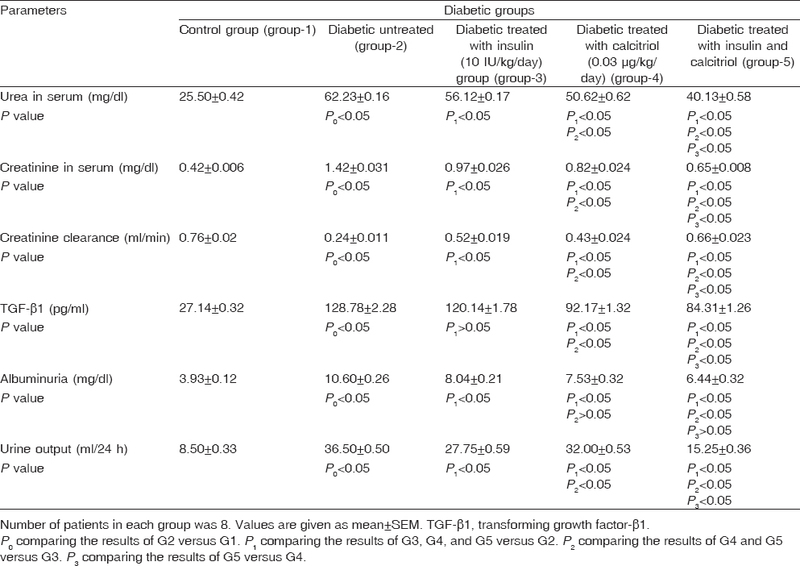 Diabetic treated group (G5): It received both insulin and calcitriol similarly as in groups 3 and 4. At the end of experiment (4 weeks), the following examinations was done: body weight and the systolic blood pressure (SBP) were measured at the beginning and the end of the study. SBP was measured by using bi-channel rat tail plethysmography and pneumatic pulse transducer . Twenty-four hour urine samples were collected from all rats using metabolic cage for measuring urine output/24 h. Albuminuria was measured by immunoassay kits , and urinary creatinine was calculated by a formula . Creatinine clearance was calculated according to the follows equation: , where U is urine creatinine and P is plasma creatinine. After urine collection, rats were anesthetized with diethyl ether. Venous blood samples were collected in heparinized capillary tubes from the retro-orbital plexus, and serum was used for measuring glucose, insulin, and AGEs. Serum urea and serum creatinine were measured spectrophotometrically using available commercial kits from Biodiagnostic (Egypt). After blood collection, the rats were killed. The left kidney was removed and fixed in 10% neutral buffered formalin and processed for histopathology. The other kidney was rapidly washed in ice-cold saline (0.9%) and homogenized in chilled PBS (0.1 mol/l, pH 7.4) using a glass tissue homogenizer for TGF-β1 analysis using commercially available ELISA kits following the instructions of the manufacturer (eBioscience Inc., USA). Histopathological study and mallary trichrome staining were done for detection of collagen fiber, and periodic acid Schiff (PAS) for mucopolysaccharides. Other sections were immunohistochemistry stained for detection of caspase-3 expression . The results of the blood glucose level, serum insulin level, AGEs, body weight, SBP, kidney biochemical parameter, kidney weight, and kidney tissue homogenate TGF-β1 were collected, tabulated, and statistically analyzed using the SPSS program for windows (version 16; SPSS Inc.) IBM Corporation (Armonk, New York, United States). Results were expressed as mean ± SEM. Statistical evaluation was carried out using one-way analysis of variance. All P values were two sided. P values equal or less than 0.05 were statistically significant. Effect of calcitriol on the blood glucose level, serum insulin level, AGEs, body weight, SBP, kidney biochemical parameter, kidney weight, and kidney tissue homogenate TGF-β1 were summarized in tables and compared in different groups. Serum glucose showed significant increase in all diabetic rats compared with G1 (P < 0.05). There was significant improvement in serum glucose by using insulin to 189.72 ± 3.97 mg/dl (P < 0.05). Calcitriol significantly decreased serum glucose to 274.53 ± 4.17 mg/dl (P < 0.05), but the level still remained over 200 mg/dl. The combination therapy of insulin with calcitriol exhibited a profound response over monotherapy and decreased blood glucose level to 152.02 ± 4.29 mg/dl (P < 0.05) [Table 1]. Body weight significantly decreased in G2 compared with G1 and significantly increased in G3 and G5 compared with G2 (P < 0.05). However, there was no significant change in G4 compared with G2 (P > 0.05). Administration of both calcitriol and insulin showed no significant change in the body weight (P > 0.05) compared with G3. Coadministration of insulin and calcitriol showed significant increase in the body weight compared with calcitriol alone (P < 0.05) [Table 2]. Significant increase in SBP of G2 compared with G1 was observed, whereas treatment with calcitriol alone (G4) or combined with insulin (G5) showed significant decrease in SBP when compared with G2 (P < 0.05), but insulin alone showed no significant change (P > 0.05) [Figure 1]. Figure 1: Effect of calcitriol on systolic blood pressure (SBP) of diabetic rats. Serum insulin level showed significant decrease in G2 compared with G1 (P < 0.05). However, G3 showed no significant change (P > 0.05). Calcitriol alone or with insulin showed significant increase in serum insulin level compared with G2 (P < 0.05) (P < 0.05) [Table 1]. AGEs significantly increased in G2 compared with G1 (P < 0.05). Insulin alone and calcitriol alone or with insulin showed significant decrease in AGEs compared with G2 (P < 0.05). Calcitriol alone or combined with insulin significantly decreased the serum level of AGEs (P < 0.05). The level of AGEs was significantly decreased with combined treatment with insulin and calcitriol compared with calcitriol alone (P < 0.05) [Table 1]. Serum urea, creatinine, creatinine clearance, urine output, and urine albumin in G2 were significantly increased compared with those in G1 (P < 0.05). Moreover, insulin-treated group, calcitriol alone-treated group, and calcitriol with insulin-treated group showed significant decrease of these parameters compared with G2 (P < 0.05). However, the reduction in albuminuria induced by calcitriol alone showed no significant changes versus insulin-treated group (P < 0.05). Moreover, coadministration of calcitriol and insulin significantly reduced albuminuria in comparison with insulin-treated group (P < 0.05) without significant difference from calcitriol-treated group (P > 0.05) [Table 3]. Kidney weights of G2 were significantly increased when compared with G1. G3 and G4 showed no significant improvement of the kidney weight compared with G2 (P > 0.05). Coadministration of calcitriol and insulin showed significant improvement in the kidney weights compared with G2 (P < 0.05). G4 and G5 showed no significant changes in the kidney weight compared with G3 (P > 0.05). G5 showed no significant change compared with calcitriol alone (P > 0.05) [Table 2]. The kidney weights to body weight ratio showed significant increase in G2 compared with G1. Treatment with insulin alone or combined with calcitriol showed significant decrease of that ratio (P < 0.05). Calcitriol alone showed no significant difference (P > 0.05) [Table 2]. TGF-β1 showed significant increase in G2 compared with G1 (P < 0.05). Calcitriol alone or combined with insulin showed significant decrease of TGF-β1 compared with G2. Insulin alone showed no significant change compared with G2 (P > 0.05). Calcitriol with insulin treatment showed more significant decrease in TGF-β1 than calcitriol alone (P < 0.05) [Table 3]. The control group showed normal kidney tissues of stroma and parenchyma. The parenchyma is formed of cortex and medulla; the cortex comprises renal tubules, renal corpuscles, and renal vasculature [Figure 2]. The renal tubules and renal glomeruli revealed negative expression of caspase-3, as seen in [Figure 2]. Figure 2: (a) Control group showing normal tissues (H and E, ×400). (b) Control group showing negative expression of caspase-3 (Casp-3, ×400). (c) Diabetic untreated group (G2) showing deformed glomeruli with clumped capillary tuft (c) (H and E × 200). (d) G2 reveals accumulation of collagen fibrilis (Mallary trichrome (MT), ×200). (e) G2 showing strong PAS positive reaction (PAS, ×400). (f) G2 showing positive expression of caspase-3 (Casp-3, ×1000). PAS, periodic acid Schiff. Sections revealed variable histological changes as deformed glomeruli with clumped glomerular capillary tuft. Other glomeruli showed increased mesangial matrix and hyperplasia of mesangial cells. The renal tubules showed necrotic epithelial lining [Figure 2]. Connective tissue stroma revealed excessive deposition of collagen fibrils in the renal interstisium [Figure 2]. Strong positive PAS reaction was noticed in the renal glomeruli (evidence of glomerulosclerosis) and renal tubular casts, and moderate reaction in the renal tubular cells [Figure 2]. Positive expression of caspase-3 immune reaction was seen, which appeared as brown granules in the cytoplasm of renal tubules [Figure 2]. Sections revealed mild improvement as revealed by appearance of some renal tubules showed flatting of their epithelial lining and cystic dilation; however, other renal tubules appeared normal. Some renal glomeruli revealed glomerulosclerosis; however, other appeared normal [Figure 3]. The connective tissue revealed moderate accumulation of collagen fibrilis among renal tubules and renal vasculature [Figure 3]. PAS reaction revealed strong positive reaction in the affected renal tubules and glomeruli; however, it showed nearly normal reaction in the normal renal tubules [Figure 3]. Figure 3: Insulin-treated group. (G3) showing mild improvement. (a) (Transverse section (TB), ×1000). (b) G3 showing moderate accumulation of collagen fibrilis (MT, ×200). (c) G3 showing nearly normal positive PAS. (PAS, ×400). PAS, periodic acid Schiff. 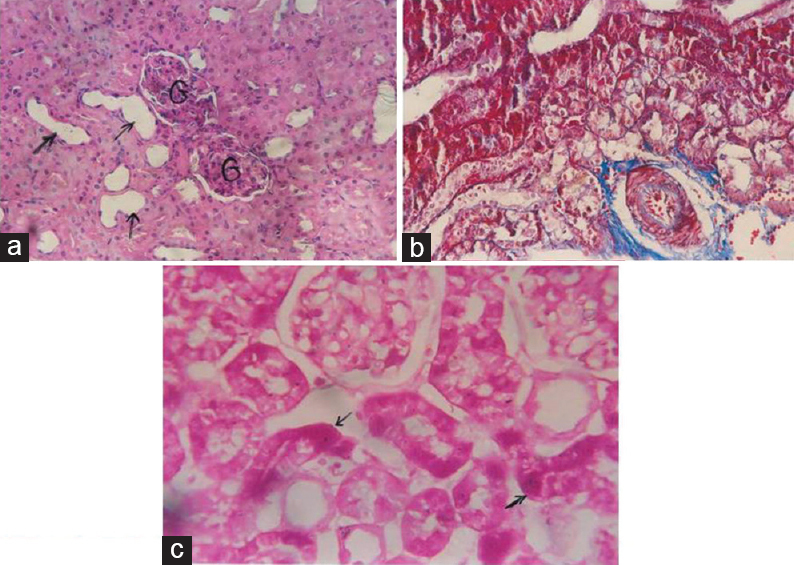 Sections revealed moderate improvement of the histological picture as most renal tubules and renal glomeruli appeared nearly like control group; however, few tubules showed flattening of their epithelial lining and desquamation, and some glomeruli showed glomerusclerosis [Figure 4]. The connective tissue appeared within normal amount [Figure 4]. The PAS reaction showed normal PAS positive reaction in the normal tubules and strong positive reaction in the affected tubules and glomeruli [Figure 4]. Caspase-3 expression was negative in most of renal tubules and glomeruli; however, the reaction was noticed in the affected tubules [Figure 4]. Figure 4: Calcitriol-treated group. (G4) showing moderate improvement of renal picture. (a) (H and E, ×200). (b) G4 showing very few collagen fibrilis (MT, ×200). (c) G4 showing nearly normal PAS reaction (PAS, ×400). (d) G4 showing negative caspase-3 (Casp-3, ×1000). PAS, periodic acid Schiff. Sections revealed very good improvement as revealed by the appearance of renal tubules; renal glomeruli and renal vasculature were more or less like control group [Figure 5]. The stroma was formed of normal amount of collagen fibers [Figure 5]. The PAS reaction appeared nearly as control group [Figure 5]. The caspase-3 showed negative expression as control group [Figure 5]. Figure 5: Insulin and calcitriol treated group (G5) showing very good improvement of histological picture. (a) (H and E, ×400). (b) G5 showing nearly normal amount of collagen fibrilis (MT, ×200). (c) G5 showing nearly normal PAS reaction (PAS, ×400). (d) G5 showing negative expression of caspase-3 (Casp-3, ×1000). PAS, periodic acid Schiff. DN is one of the major complications of DM in human, which is the leading cause of end-stage renal failure worldwide. Calcitriol status is important for achieving optimal insulin secretion, and vitamin D deficiency may have a potential role in the development of T2DM . Calcitriol role is expressed by binding with VDR, which is founded in many tissues in particularly the β-cells of pancreas , mesangial cells, and podocytes of the kidney. Podocytes are highly inducible by calcitriol . In the present study, T2DM model was created by administration of small dose of STZ after 6 weeks of feeding high-energy diet for induction of obesity, which is the most common risk factor for insulin resistance in T2DM . This is in accordance with Jian et al. , who reported that rats fed on high-fat diet were predisposed to insulin resistance as that seen in T2DM. STZ induction of DM in rats gives the clinical and pathological picture of DN similar to that seen in human . The diabetic rats of the present experiment showed the full picture of DM as hyperglycemia, polyuria, and decrease in the body weight. There was significant increase in the kidney weight to body weight ratio. Hyperglycemia was observed owing to destruction of the β-cells of pancreas by STZ: Hyperglycemia drag water with it after filtration at the kidneys that cause polyuria. Body weight loss occurred as a result of increased muscle wasting owing to loss of tissue proteins. Instead of using glucose in aerobic glycolysis, the body uses free fatty acid from stored fats that gives the wasting appearance of the diabetic rats. These results are similar to Lu et al. .
Insulin-treated group showed improvement in blood glucose level during treatment and also body weight improved. The ratio between the kidney weights to body weight showed significant change, but no improvement in the serum insulin was observed when compared with diabetic untreated group. These results were obtained on using exogenous insulin. This result could be explained as the exogenous insulin directly acts on insulin receptors and opens the glucose transporter gates in the skeletal muscles and adipose tissues to allow entry of glucose inside the cells and improve hyperglycemia, but it had no effect on insulin release from the pancreatic β-cells. 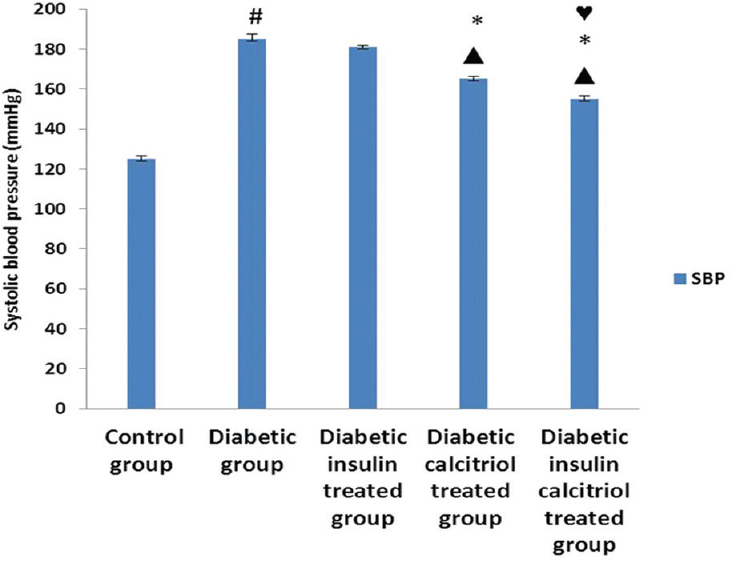 These results agree with Kuhad and Chopra  and Wang et al. .
Calcitriol-treated rats showed significant improvement in the level of serum glucose and insulin level but no significant change in the body weight of the diabetic rats and the ratio between kidney weight to body weight of that group when compared with diabetic untreated group; however, on using both insulin and calcitriol, this group showed better improvement in the body weight, blood glucose level, and insulin level when compared with diabetic untreated group. These results could occur owing to the effect of calcitriol on β-cells of pancreas, where it improved the endogenous insulin release and sensitized the peripheral tissues to uptake the glucose that reflected on the serum glucose level. Moreover, the body weight improved owing to improvement of the glucose metabolism and using it as a source of ATP production instead of free fatty acid. These results are in line with Pittas et al. who postulated that calcitriol improved both blood glucose level and insulin level through its direct effect on β-cell of pancreas by increasing Ca 2+ level, which requires for insulin release, as insulin secretion is a calcium-dependent process. Moreover, Dunlop et al. postulated that calcitriol stimulates the expression of insulin receptors on the peripheral tissues by activating peroxisome proliferator-activated receptor-δ that cause direct activation of the transcription of human insulin receptor gene through calcitriol response element in the human insulin receptor gene promoter, so calcitriol stimulates the expression of insulin receptor and enhances insulin-mediated glucose transport . In the present study, AGEs significantly increased in diabetic group when compared with control group, insulin alone showed significant decrease of AGEs when compared with diabetic untreated group, and also calcitriol alone group showed significant decrease of AGEs. Coadministration of insulin and calcitriol showed more decrease of AGEs. These results agreed with Lee et al. who postulated that calcitriol modulates the AGEs production and binding it to its receptors. Kidney has AGE receptors on the mesangial cells that respond to AGEs by increased synthesis of matrix proteins and type IV collagen. Moreover, AGEs could induce DNA damage of the podocytes via stimulation of angiotensin receptor type-1. Calcitriol causes modulation of AGEs binding with their receptors that inhibit RAS production in the kidneys, thereby protecting the kidney from injurious effects of RAS, which causes proteinuria . SBP significantly increased in diabetic untreated group. Insulin-treated group showed no significant changes when compared with the diabetic untreated group. These results disagree with Haidara et al. who postulated that use of insulin alone can improve the systolic blood pressure because insulin has dose-dependent induction of vasodilatation through production of nitric oxide (NO) by endothelial cells. This difference in the results may be owing to the difference in the DM models, where these investigators used STZ for induction of type 1 diabetes mellitus (T1DM), which is characterized by great response to exogenous insulin, but the present study used STZ at low dose with high-fat diet to induce T2DM which may show insulin resistance. Calcitriol-treated group and both insulin and calcitriol-treated groups showed significant improvement in SBP, and these results are in line with Dong et al. who postulated that calcitriol protects against renovascular hypertension through downregulation of the expressions of angiotensin receptor type-1 and upregulation of superoxide dismutase type 1 and 2, which prevents the ROS overproduction in an animal model of hypertension. Diabetic untreated group showed the full picture of the DN when compared with the control group, where the serum urea, serum creatinine, and creatinine clearance significantly increased, reflecting the glomerular filtration rate of the kidney. There was hyperfiltration, with increase in urine output and albumin loss in urine, which reflects the great damage to the podocytes cells of the kidneys, which are the last defense barriers that prevent loss of proteins in urine. These results agreed with Wang et al. . In the present study, there was significant increase in the kidney tissue homogenate of TGF-β1 which correlated with increase in the kidney weight of diabetic untreated group owing to ECM accumulation and glomerular hypertrophy and significant increase in the kidney weight to body weight ratio in this group, which agreed with Kuhad and Chopra  and Tian et al. .
Insulin alone showed significant improvement in the biochemical kidney function parameters, and these results agreed with Filippone et al. who postulated that exogenous insulin could protect the kidney against the effect of hyperglycemia in both T1DM and T2DM, as podocytes express insulin receptors and require normal insulin signaling for sustained viability. In vitro, podocytes respond to insulin at physiologic levels by translocating the glucose transporters GLUT1 and GLUT4 to the cell membrane, with a resultant doubling of glucose uptake. This response is dependent on both a normally functioning nephrin and actin cytoskeleton . Reduced nephrin expression occurs in both early and advanced DN . Insulin alone had no significant effect on TGF-β1 when compared with diabetic untreated group; these results disagree with Kuhad and Chopra , where they founded that exogenous insulin could significantly decreased TGF-β1 as they suggested that administration of insulin with antioxidant substance like tocotrienol causes significant suppression of the tumor necrosis factor-α-mediated nuclear factor-κβ signaling pathway where nuclear factor-κβ is a mediator for various cell stress-associated stimuli including growth factors, vasoactive agents, and cytokines. The difference in the results could be explained by the difference in the model where the investigator used T1DM model of diabetes with no insulin resistance. The results of the present study were in partial agreement with other studies that considered that external insulin promotes the development of diabetic retinopathy where it stimulates the expression of insulin-like growth factor-I receptor; this receptor upregulates the level of vascular endothelial growth factor, and vascular endothelial growth factor promoted neovascularization that resulted in aggravating lesions of the diabetic retinopathy . Moreover, insulin increased the quantity and adhesion of leukocytes in the microcirculation, which causes ischemia and hypoxia in microcirculation leading to increase bleeding and oozing in microcirculations . In the present study, using calcitriol alone or in combination with insulin showed high significant improvement in the kidney function parameters and TGF-β1 of the kidney tissue homogenate. These results agreed with Tian et al. and Lee et al. who suggested that calcitriol treatment attenuated the upregulations of receptors of advanced AGEs in diabetic rat hearts. In addition, calcitriol modulated the effects of inflammatory cytokines such as tumor necrosis factor-α, angiotensin receptor-1, and TGF-β1 which are up-regulated in DM. Panichi et al. showed that vitamin D3 significantly reduce the proliferation of mesangial cell and the excretion of proteinuria in vitro. Kuhlmann et al. founded that vitamin D3 can decrease podocyte loss and podocyte hypertrophy in subtotally nephrectomized rat model, and also it protects podocytes from apoptosis and changes in the cytoskeleton. All the biochemical parameters were impaired in the diabetic untreated group when compared with control group, augmented by the histological examination of the kidney tissues by light microscope that showed proliferation and hypertrophy of mesangial cells and accumulation of mesangial matrix that leads to enlarged glomeruli. These results agreed with Ha and Lee , who reported that ROS plays an important role in the development and progression of DN, as it causes upregulation of TGF-β1, plasminogen activator-1, and ECM proteins by glomerular mesangial cells, leading to mesangial expansion. The presence of inflammatory cells in the renal interstisium of diabetic untreated group of this study was in harmony with other investigators such as Alhaider et al. who reported that diabetes exhibits biochemical changes and causes modulation of the ROS and proinflammatory genes that leads to accumulation of inflammatory cells. Moreover, Chow et al. suggested that more fibrosis and renal injury in DN was associated with increased number of kidney macrophages. The vascular lesion reported in the present study, which was represented by damage of the vascular endothelial cell lining, vaculation of the media of renal vessel, and perivascular infiltration of inflammatory cells, could be attributed to the effect of ROS induced by diabetes, as reported by Malik et al. , who demonstrated thickening of the basement membrane of the endothelial capillaries, endothelial hyperplasia, and reduction of luminal area of end neural blood vessels, denoting diabetic microangiopathy. The present study showed mild improvement by using insulin alone and moderate improvement by using calcitriol alone and excellent improvement after using both insulin and calcitriol owing to the pervious mechanisms. Moreover, antifibrotics such as atorvastatin had renoprotective effect in an experimental model of obstructive nephropathy . In the present study, immunohistochemistry examination revealed that diabetic untreated group showed positive immune reaction of the caspase-3 when compared with control group and significant decrease in the caspase-3 expression on administration of calcitriol alone or in combination with insulin, and these results partial agree with Wang et al. who reported that podocytes VDR mediates the antiproteinuric action of calcitriol and its analogs. Vitamin D3 causes inhibition of enzymes that are responsible for apoptosis such as caspase-3. Vitamin D3 (calcitriol) has a protective effects in DN in rats through significant decrease of TGF-β1 and caspase-3 in the kidney tissues of the diabetic rats and significant improve of the kidney function parameters, so it could be used in future for clinical application to treat renal dysfunction in diabetic patients. Navarro-Gonzalez JF, Mora-Fernandez C. The role of inflammatory cytokines in diabetic nephropathy. J Am Soc Nephrol 2008; 19:433–442. Moser JT, Langdon DR, Finkel RS, Ratcliffe SJ, Foley LR, Andrews-Rearson ML, et al. The evaluation of peripheral neuropathy in youth with type 1 diabetes. Diabetes Res Clin Prac 2013; 100:3–6. Tuttle KR. Linking metabolism and immunology: diabetic nephropathy is an inflammatory disease. J Am Soc Nephrol 2005; 16:1537–1538. Kanter M. Protective effects of thymoquinone on streptozotocin-induced diabetic nephropathy. J Mol Histol 2009; 40:107–115. Kamiyama M, Zsombok A, Kobori H. Urinary angiotensinogen as a novel early biomarker of intrarenal renin-angiotensin system activation in experimental type 1 diabetes. J Pharmacol Sci 2012; 119:314–323. Ritz E. Diabetic nephropathy. Saudi J Kidn Dis Transpl 2006; 17:481–490. Vasavada N, Agarwal R. Role of oxidative stress in diabetic nephropathy. Adv Chron Kidn Dis 2005; 12:146–154. Lee YH, Choi SJ, Ji JD, Song GG. Vitamin D receptor ApaI, TaqI, BsmI, and FokI polymorphisms and psoriasis susceptibility: A meta-analysis. Mol Biol Repl 2012; 39:6471–6478. Tian Y, Lv G, Yang Y, Zhang Y, Yu R, Zhu J, et al. 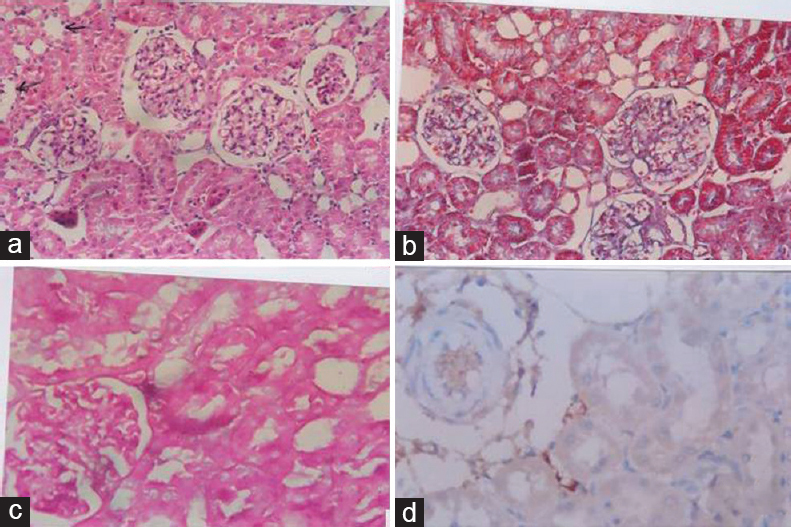 Effects of vitamin D on renal fibrosis in diabetic nephropathy model rats. Int J Clin Exp Pathol 2014; 7:3028–3037. Ren Z, Li W, Zhao Q, Ma L, Zhu J. The impact of 1,25-dihydroxy vitamin D3 on the expressions of vascular endothelial growth factor and transforming growth factor-β1 in the retinas of rats with diabetes. Diabetes Res Clin Pract 2012; 98:474–480. Kuhad A, Chopra K. Tocotrienolattenuates oxidative-nitrosative stress and inflammatory cascade in experimental model of diabetic neuropathy. Neuropharmacol 2009; 57:456–462. Makaritsis KP, Yue-Du HG, Chobanian AV. α1-Adrenergic plus angiotensin receptor blockade reduces atherosclerosis in apolipoprotein E-deficient mice. Hyperten 1998; 32:1044–1048. Schlatzer D, Maahs DM, Chance MR, Dazard JE, Li X, Hazlett F, et al. Novel urinary protein biomarkers predicting the development of microalbuminuria and renal function decline in type 1 diabetes. Diab Care 2012; 35:549–555. Park EK, Watanabe T, Gee S, Schenker MB, Hammock BDl. Creatinine measurements in 24 h urine by liquid chromatography tandem mass spectrometry. J Agric Food Chem 2008; 56:333–336. Henry JB. Clinical chemistry, principles and technics. 2nd ed. Hagerstown, MD, USA: Harper and Row; 1974. p. 525. Bancroft J, Steven L. Theory and practice of histological techniques. 4th ed. Edinburgh: Churchill Livingstone; 1996. p. 766. Nikooyeh B, Neyestani TR, Farvid M, Alavi-Majd H, Houshiarrad A, Kalayi A, et al. Daily consumption of vitamin D or vitamin D+calcium- fortified yogurt drink improved glycemic control in patients with type 2 diabetes: a randomized clinical trial. Am J Clin Nutr 2011; 93:764–771. Valdivielso JM. The physiology of vitamin D receptor activation. Contrib Nephrol 2009; 163:206–212. IndaFilho AJ, Melamed ML. Vitamin D and kidney disease: what we know and what we do not know. J Bras Nefrol 2013; 35:323–331. Jain D, Bansal MK, Dalvi R, Upganlawar A, Somani R, et al. Protective effect of diosmin against diabetic neuropathy in experimental rats. J Integr Med 2014; 12:35–41. Hu YY, Ye SD. Experimental models of type 2 diabetic nephropathy. Chin Med J (Engl) 2013; 126:574–577. Lu HJ, Tzeng TF, Liou SS, Da Lin S, Wu MC, Liu IM. Polysaccharides from Liriopes Radix ameliorate streptozotocin-induced type I diabetic nephropathy via regulating NF-κB and p38 MAPK signaling pathways. BMC Compl Altern Med 2014; 13:156. Wang J, Liu H, Li N, Zhang Q, Zhang H. The protective effect of fucoidan in rats with streptozotocin-induced diabetic nephropathy. Mar Drugs 2014; 12:3292–3306. Pittas AG, Lau J, Hu FB. The role of vitamin D and calcium in type 2 diabetes. A systematic review and meta-analysis. J Clin Endocrin Metab 2007; 92:2017–2029. Dunlop TW, Väisänen S, Frank C, Molnár F, Sinkkonen L, Carlberg C. The human peroxisome proliferator-activated receptor delta gene is a primary target of 1alpha, 25-dihydroxyvitamin D3 and its nuclear receptor. J Mol Biol 2005; 349:248–260. Li J, Byrne ME, Chang E, Jiang Y, Donkin SS, Buhman KK, et al. 1,25 Dihydroxy vitamin D hydroxylase in adipocytes. J Steroid Bioch Mol Biol 2008; 112:122–126. Lee TW, Kao YH, Lee TI, Chang CJ, Lien GS, Chen YJ. Calcitriol modulates receptor for advanced glycation end products (RAGE) in diabetic hearts. Int J Cardiol 2014; 173:236–241. Fukami K, Yamagishi S, Kaifu K, Matsui T, Kaida Y, Ueda S, et al. Telmisartan inhibits AGE-induced podocyte damage and detachment. Microvasc Res 2013; 88:79–83. Haidara MA, Mikhailidis DP, Rateb MA Ahmed ZA, Yassin HZ, Ibrahim IM, Rashed LA. Evaluation of the effect of oxidative stress and vitamin E supplementation on renal function in rats with streptozotocin-induced type 1 diabetes. J Diabetes Complications 2009; 23:130–136. Dong J, Wong SL, Lau CW, Lee HK, Ng CF, Zhang L, et al. Calcitriol protects renovascular function in hypertension by down-regulating angiotensin II type 1 receptors and reducing oxidative stress. Eur Heart J 2012; 33:2980–2990. Filippone EJ, Gupta A, Farber JL. Normoglycemic diabetic nephropathy: the role of insulin resistance. Case Report Nephrol Urol 2014; 4:137–143. Coward RJ, Welsh GI, Yang J, Tasman C, Lennon R, Koziell A, et al. The human glomerular podocyte is a novel target for insulin action. Diabetes 2005; 54:3095–3102. Coward RJ, Welsh GI, Koziell A, Hussain S, Lennon R, Ni L, et al. Nephrin is critical for the action of insulin on human glomerular podocyte. Diabetes 2007; 56:1127–1135. Lu M, Amano S, Miyamoto K, Garland R, Keough K, Qin W, et al. Insulin-induced vascular endothelial growth factor expression in retina. Inves Ophthalmol Visu Sci 1999; 40:3281–3286. Hirata F, Yoshida M, Niwa Y, Okouchi M, Okayama N, Takeuchi Y, et al. Insulin enhances leukocyte-endothelial cell adhesion in the retinal microcirculation through surface expression of intercellular adhesion molecule-1. Microvascul Res 2005; 69:135–141. Panichi V, Migliori M, Taccola D, Filippi C, De Nisco L, Giovannini L, et al. 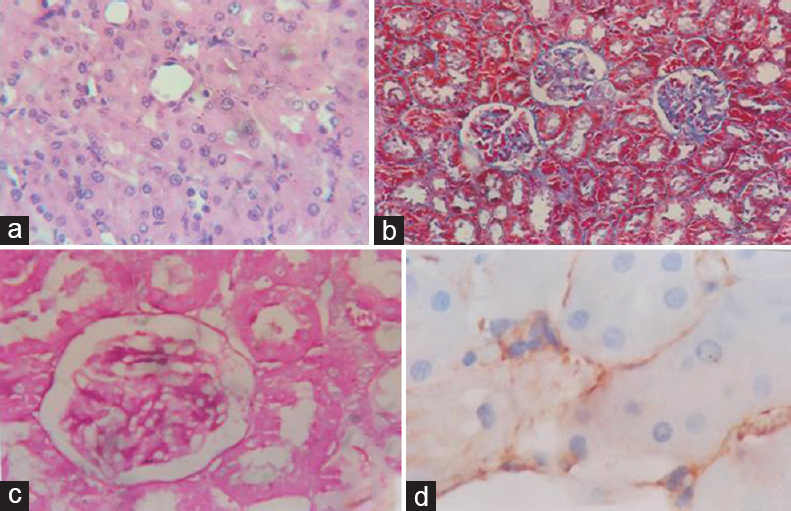 Effects of 1,25(OH) 2D3 in experimental mesangial proliferative nephritis in rats. Kidney Int 2001; 60:87–95. Kuhlmann A, Haas CS, Gross ML, Reulbach U, Holzinger M, Schwarz U, et al. 1,25-Dihydroxyvitamin D3 decreases podocyte loss and podocyte hypertrophy in the subtotallynephrectomized rat. Am J Physiol Renal Physiol 2004; 286:F526–F533. Ha H, Lee HB. Reactive oxygen species and matrix remodeling in diabetic kidney. Am Soci Nephrol J 2003; 14:S246–S249. Alhaider AA, Korashy HM, Sayed-Ahmed MM, Mobark M, Kfoury H, Mansour MA. Metformin attenuates streptozotocin-induced diabetic nephropathy in rats through modulation of oxidative stress genes expression. Chem Biol Inter 2011; 192:233–242. Chow FY, Nikolic-Paterson DJ, Atkins RC, Tesch GH. 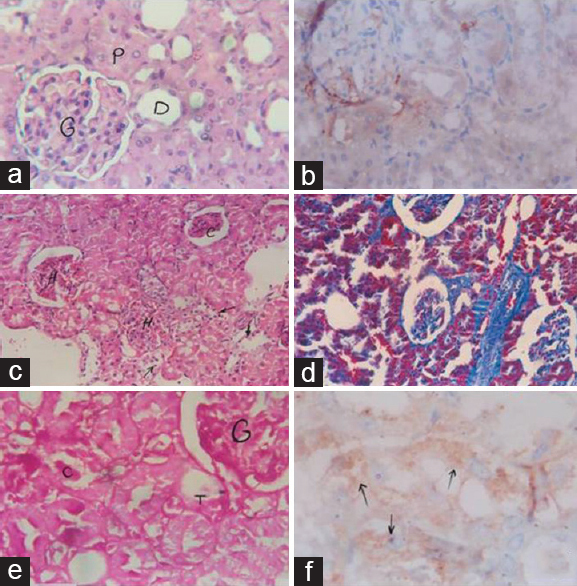 Macrophages in streptozotocin-induced diabetic nephropathy: potential role in renal fibrosis. Nephrol Dial Transpl 2004; 19:2987–2996. Malik RA, Tesfaye S, Newrick PG, Walker D, Rajbhandari SM, Siddique I, et al. Sural nerve pathology in diabetic patients with minimal but progressive neuropathy. Diabetologia 2005; 48:578–585. El Sayed M Abd El Salam, Mahmoud H El Odemi, Adel H. Omar, Fatma A. El-Serafy, Tarek F Abd El Hakim, Rehab M. Samaka, et al. Effect of atorvastatin and erythropoietin on renal fibrosis induced by partial unilateral ureteral obstruction in rats. Menoufia Med J 2014; 27:197–204. Wang Y, Deb DK, Zhang Z, Sun T, Liu W, Yoon D, et al. Vitamin D receptor signaling in podocytes protects against diabetic nephropathy. J Am Soc Nephrol 2012; 23:1977–1986.